Ember is a very active club that provides its membership with opportunities to compete against fellow bowlers throughout the area in a variety of external competitions. The Surrey County Bowling Associations run County Competitions for both Men and Ladies in Fours, Triples, Pairs and Singles. Currently 12 club members have been awarded their County badge (6 Ladies & 6 Men). Our ladies have an excellent track record in these competitions. In 2009 they reached the semi-final of the Surrey County Top Club event and our Ladies Champion reached the last 16 of the National Champion of Champions competition. In 2011 Jenny Baird & Linda Pillman won the County Pairs Championship. 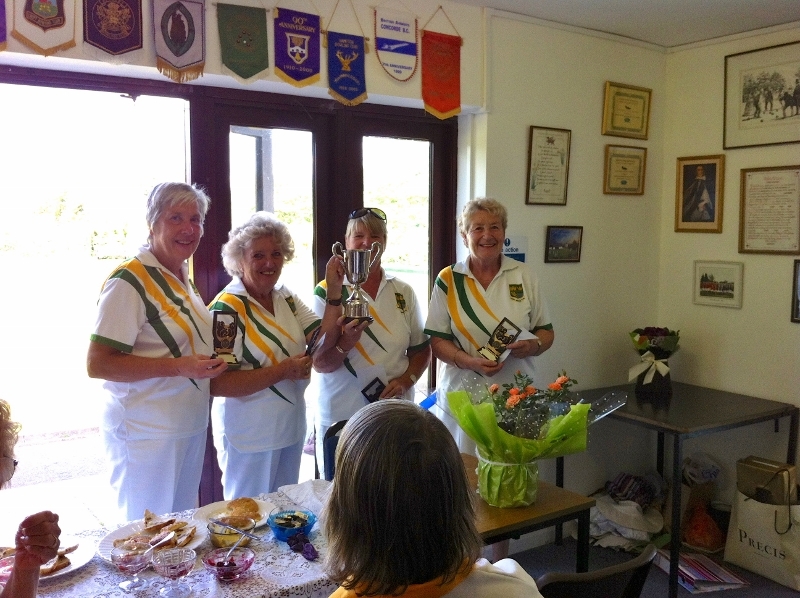 In 2012 four of our ladies got to the final of the County Fours Championship. In 2013 the ladies were back to winning ways with Jenny Baird winning the County Officers Cup, a feat she repeated in 2016. Ember is also the home club of Linda Pillman, Junior Vice-President of Surrey County Women’s Bowling Association and of John Round, an Honorary Vice-President of the Surrey County Bowling Association. Ember is affiliated to the North West Surrey Bowling Association and enters teams in the Friday evening Men’s Double Rinks League. We also have a team in the top division of the Thursday evening Mixed Fours League and were league champions in 2014, bringing our total to five championships in recent years. 2017: Mixed Fours Championship and Australian Pairs Championship. In 2008 we joined the Racal Decca 3-Rink Mixed League. Matches are played throughout the season against a number of local clubs and Ember were champions in 2008, 2009. 2012, 2014 and 2017. We also won their knock-out cup in 2016. Ember runs the popular Men’s Coronation Triples event for local clubs. Matches are played on Sunday mornings and the competition has been staged every year since 1953, the year of the Queen’s coronation. Ember are the current holders and also won the competition in 2010 & 2016 and were runners up in 2009 and 2011. We regularly enter the Men’s and Ladies’ National Club competitions. In addition teams have been entered for the local Area Mixed Top 10 competition, the Surrey Men’s Top Four and the Surrey Ladies’ Benevolent Triples competitions. Members can also enter Open and Invitation competitions run by other clubs. Typically these are day-long competitions like that run by Bishop Duppas BC, where a team of our ladies were successful in the 2014 competition. Ember has their own popular internal Evening Mixed Triples League with teams selected on a handicap basis. We also run sixteen different club competitions each year, some on a handicap basis. All finals are held over the first complete weekend in September and are always very well supported. More details of our internal events can be found on the Club Activities page.